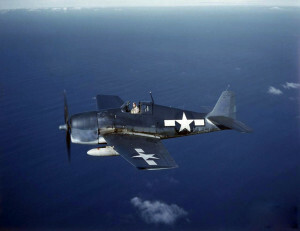 On May 16, 1944, Ensign Marion F. DeMasters took off from Charlestown Auxiliary Naval Air Station in an F6F-3 Hellcat, (Bu. No. 42550), for a rocket gunnery practice flight over Matunuck Beach, about five miles from the airfield. This training consisted of diving from an altitude of 6,000 feet towards a simulated target on the beach while maintaining a constant 40 degree glide angle. While making his seventh training dive for the day, a large portion of the rear stabilizer suddenly tore away. Ensign DeMasters was able to bring his aircraft in for an emergency landing at the air station, but just as he was about to touch down a gust of wind forced the right wing to strike the runway. The aircraft suffered severe damage, but the pilot was not hurt. Ensign DeMasters was assigned to VF-74.